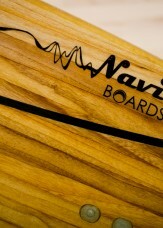 Navis Boards is a small company in Sweden that has challenged the big dragons on the kiteboard market. The boards from Navis Boards stand out from the crowd in two ways that are obvious at the first glance. The boards alone are handmade and made purely from environmentally friendly materials which give them their nice woodish look. So what about the performance then? I have already been riding the board named “Bolt” for some time. An allround medium sized board that is suitable for the beginner as well as the intermediate rider, a compromise between a lightwind board and a freestyle board. “Foucan” on the other hand is a board aimed for the more advanced rider that prefer a smaller and stiffer board that allows him to perform tricks with ease. You might have you heard the name Foucan from the somewhat odd sport named Le-Parkour. In this field Foucan is the name of a guy that is known for his outstanding skills in Le-Parkour, hence “Foucan” is a board designed with this guy in mind, a board for the one that likes to have fun on the water while jumping around and performing tricks. Anyway, let´s take a closer look on the characteristics and performances of the “Foucan”! The Foucan is a stiff board. Not super stiff, but stiff enough to make it easy to achieve good pop, great for unhooked tricks and all kind of tricks, such as the backroll, where you need to set yourself in a rotation. Foucan is designed with Navis Boards new unique “spring technology” which further improves the pop force. This technology can be seen as the black arcs on the board. These arcs are working both as reinforcement for the board while providing the board with extra spring effect. The size of the Foucan is 132×41 (136×42 is also available). Shorter boards are not known to make it easier to go upwind, but the width of the board weigh up its shorter length and it can be compared to a 135×40 board if you just look at the area of the board. In other words, the upwind abilities are actually pretty good, especially in strong wind where you really can carve the board deep in the water and achieve a good amount of resistance. The Foucan is designed to be used in flat and choppy water. The rocker of the board is slightly curved which comes handy once you hit choppy water. The Foucan also performs well in waves with fine comfort compared to some other boards. Ride in high speed and the board tends to spray some water in small waves. This is however not a major problem, just approach the waves in a sharper angle with more pressure on the back foot and you’ll more or less solve this little issue. To jump with the Foucan is a pleasure. The light weight (2.55kg for the 132×41 board) and short length of the board makes it easy to stay balanced in the air, so you can say goodbye to unwanted rotations in the air. The stiffness of the board also helps you to explode up from the water during the takeoff. 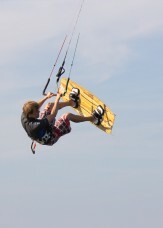 The width of the board improve the stability when you´re landing a trick or when you´re going downwind. The tips of the board are thinner than the center of the board which also makes them a bit more flexible which is nice when you land tricks and jumps since the tips act as shock absorbers. The “liquid super strong rails” are a bit rounded (this can be customized upon request), but sharp enough to deliver good grip during turns. The new dual concave rocker further increase the stability and board control. “Foucan” is a board designed primarily for the intermediate to advanced freestyle rider. At the same time, the board characteristics such as the light weight, the small size and the flex make it an excellent board for old school tricks. Ride the “Foucan” in medium to strong wind and flat water to fully take advantageous of its high performance characteristics. 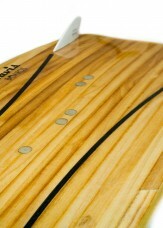 The price for the board with fins, pads and board handle included is €505.00. This equals approximately $630, about the same price level as the cheapest factory made boards on the market. Considering that “Foucan” is handmade with excellent board properties with a really nice finish make this board very affordable! Click on this link for another small review about Navis Boards.